Susanʼs father sat her on her first pony at age four. Instant love! When she was eight, she began taking saddle seat lessons after she moved to South Carolina to live with her grandmother. Starting her life as a trainer when she was eleven with her pony stallion, Nikki, she taught him tricks. They competed at the South Carolina State Show in Children's Pleasure and Pair Classes where the team placed 3rd. 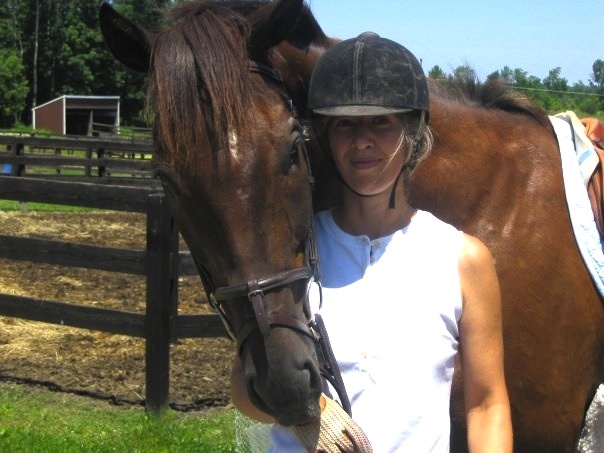 Susan became a “junior jockey” at two different stables in Columbia, SC. riding any horse that came her way. Clearly, her equestrian future was inevitable. In 1965, fifteen-year old Susan came to Ithaca to live with her father, Cushing Phillips, a civil engineer at Cornell. For her sixteenth birthday she was given “Rebel,” her first and faithful lesson horse. They built a barn, tack and feed room. There, in that early bit of heaven, she trained horses and taught the neighborhood kids. By the early 1970ʼs Susan had a full time job, a young son and four horses. Her father had dismantled and moved the barn they had built to Brooktondale, with a usable ring and jump course in a neighborʼs open field. Clients successfully participated in 4H, the Red Jacket Pony Club, started by Susan, Audrey Lowe and Mary Jane Jacobson (still active today), local and rated shows. Susanʼs second marriage to Bill Lowe brought a partnership that would produce If Only Farm. They broke ground on Wood Road in 1979, and by 1982 the first barn, paddocks and outdoor ring were completed. Showing successes followed. In 1987, four students had qualified for, and competed in the USHA (now USEF) National Pony Finals, with Cathe Litzel, one of If Only Farmʼs students, finishing 3rd in the Equitation Class. Over the years, clients have competed and taken top ribbons from the local level to the Nationals. If Only Farm horses and riders have shown competitively at Zone II Finals in the Adult and Junior Divisions, many National Pony Finals, Equitation Finals in Harrisburg, Regionals at Old Salem, Devon, Lake Placid, and Saratoga Horse Shows. Ponies and Jumpers have finished in the top ten in the USEF End of the Year Awards, Zone II and PHA. Joan has been riding as long for as she can remember. Her real equestrian eduction began at If Only Farm when she was 40 years old with her daughter, Cathe. With Susan Lowe as her trainer, Cathe placed 3rd in National Pony Equitation Finals in 1987 and went on to qualify for the Medal Maclay, and USET on her hunter, Huntington Bay. Joan was the groom! Many of Joan's students have gone on to compete successfully in local and regional competitions. She focuses on beginner/intermediate riders and loves to take a child from the beginning of their riding experience, and prepare them for a safe, competitive, and effective horsemanship future. Joan has been teaching for over 25 years. as assistant coach in 2006 and has lead the 35-strong squad since 2011. National Championships the same year. Equitation Over Fences division at the IHSA Nationals in Los Angeles. 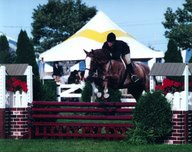 became a prominent rider on the East Coast showing "A" circuit, winning classes at the Hampton Classic, HITS, Fairfield and Old Salem on her horse, Splashdown (pictured). The Appaloosa / Quarter horse cross came into her life when she was 14, starting a winning athletic partnership and a deep love affair that lasted 13 years. In 1999, Audra and Splashdown were Champion at the Hampton Classic in the Junior Hunter Division. Audra is loved by her students for her natural ability to build a calm confidence in both rider and horse. She prides herself in taking every student - from beginners to advanced Hunter, Jumper and Equitation competitors - to the next level. In 2006, Audra earned her Master's degree in Exercise Physiology from Ithaca College. Heidi has been riding for 15 years, and is an If Only Farm native as almost everything she knows she's learned here, though she's also taken several clinics with dressage rider Pam Goodrich. Heidi specializes in dressage, and flat lessons for all disciplines. As a professional cellist and long-time cello teacher, she is especially interested in the biomechanics of riding, focusing on correct position and relaxation in order to ride efficiently and beautifully. These same qualities, relaxation and correct position, are necessary to play the cello well and she finds the similarities fascinating and helpful. Body awareness is absolutely key to doing any discipline well and riding has helped her playing, and vice versa. Since the Spring of 2016 Tracy Durham has offered private and semi-private dressage lessons once a month at If Only Farm. Tracy has earned Regional and National titles from Training Level to Grand Prix all on self-trained horses and has trained with many top dressage riders. 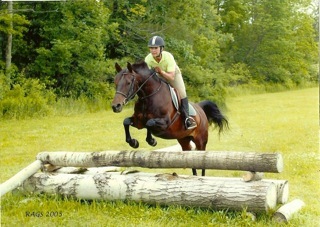 Riders and horses of any discipline can benefit from and will enjoy working with Tracy. More information about Tracy Durham's Clinics.